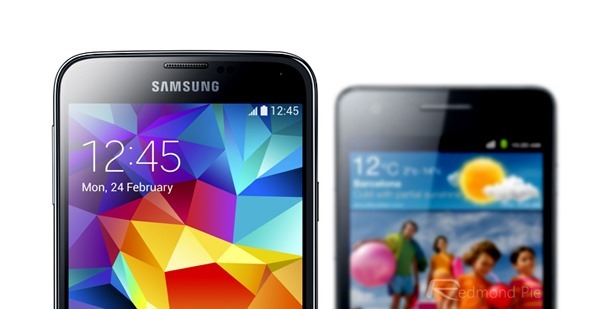 The first rumored, then highly anticipated flagship of the year, the Samsung Galaxy S5 has finally been unveiled, and most disappointingly, has left most of the Internet (read: technology world) unimpressed. Irrespective of how the device has been perceived, what followed was pretty much exactly what we see after every flagship device sees the light of day – comparisons upon comparisons to decide which is the best gadget money can buy. 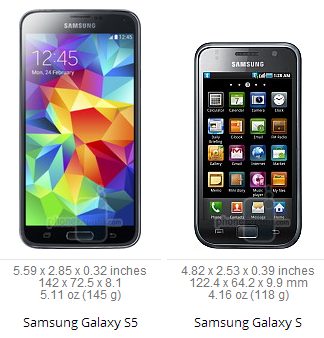 And Galaxy S5 has been no different. During the last 24 hours that have passed since the device’s unveiling, we’ve seen pretty much all kinds of comparisons imaginable – from those pitting the new Samsung beast against top of the line offerings from the likes of LG, Motorola, Sony, HTC – some going so far as to compare the Galaxy S5 against phones that haven’t even been released yet, including the HTC One 2014 Edition and the Apple iPhone 6! Yet, it seems the simplest things are sometimes the most interesting ones, and thus, a size comparison coming from Phone Arena catches our attention. 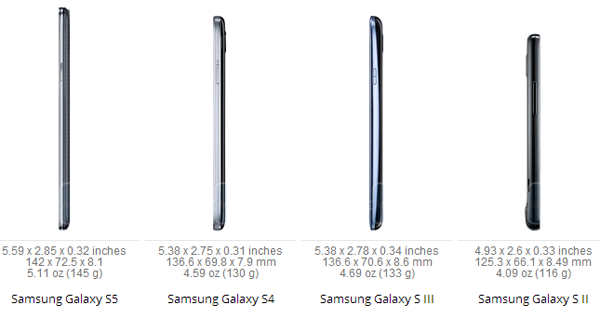 What they’ve done is simply compare the size of the newly-released Galaxy S5 with all its predecessors, all the way back to the first Galaxy S GT-I9000. 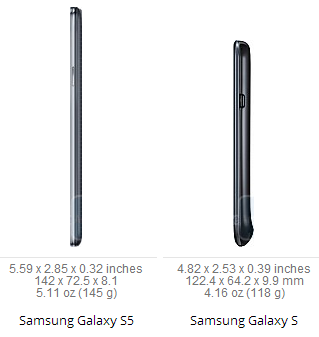 We’ve come a long way since then, and the comparison shows that with images of all the devices side by side, putting things in perspective using Phone Arena’s size comparison tool. It’s interesting to see how the size of the Galaxy flagships has increased year over year, yet the shape hasn’t changed so much. 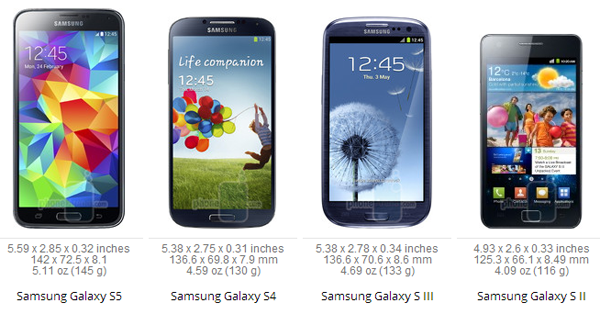 Indeed, if you look at all the five devices, the Galaxy S II is the only one that stands out, with a form factor that’s visibly different from the rest. Another interesting fact is that the Galaxy S5 and the Galaxy S bear a close resemblance in appearance, with the fifth iteration being the slightly more attractive one. In the world of Android, larger screen sizes have suddenly caught up, and as much resistance that they faced in the beginning, masses seem to have warmed up to larger phones over the years. Then again, even when the original GT-I9000 was released, it was a huge device back in the day – 4-inch displays were hardly the norm – and I remember buying one just because it served a much-felt entertainment size gap. However, with today’s phablets, I tend to think there should be a upper limit to the size that you can go to – bigger isn’t always better.